Learn the difference between a foundation and a trust or a society. 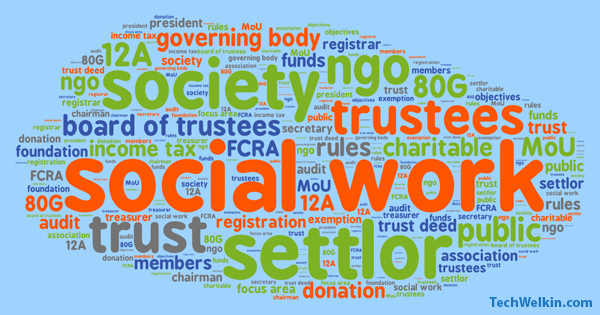 NGOs can either be registered as trust, society or section 25 company. Well, I did not know that my articles on how to register a trust and a society will be able to help so many people out there. I am glad that the tendency of doing social work is growing in India. One of the most frequently asked questions on my NGO related articles is, “what is the difference between a foundation and a trust” or “what is the difference between a foundation and a society”. So many people have asked me this question that now I am forced to write a separate article to answer it. First of all, if you also want to know the difference between a foundation and NGO, I would like to congratulate you for thinking about social work. As I explained in my articles, both a trust and a society are two forms of a non-profit or non-government organization in India. So, if you want to do social work and want to have a legal entity for this purpose, then you register either a trust or a society. You can also register a Section 25 company, but mostly people register trust or a society for charitable work. Trust is a simpler entity. It is easier to register and run. Such an organization is primarily based on trust. Donors give you money “trusting” that you will make good use of it for the objectives stated in your trust deed. Trustees are not answerable to anyone except the Charity Commissioner and the relevant laws. If the Income Tax department is providing 80g and 12a exemptions —they can revoke it if trustees do not follow the rules and objectives mentioned in the trust deed. Society, on the other hand is a more democratic organization. All the members of the governing body are also answerable to each other and they have to keep the donors and the Registrar of Societies informed about what decisions are being made by them. Societies have to keep records of the meetings of the governing body. OK, now we know the basic information about trust and society. But what is a foundation? Well, “foundation” is just a word! There is nothing like a foundation that you can register. Foundation is just a word that many NGOs use in there names. For example, some ABCXYZ Foundation could either be registered as a society or as a trust. Foundation is an optional word —you don’t have to use it in the name of your organization. If you want, you can use it —if you don’t want, don’t use it! Simple. I hope now you will not get confused. Select the type of NGO from trust or society. In the name, you can use the word foundation, if you want. I hope it was useful for you. Should you have any questions about this topic, feel free to ask me through comments section. I will try to best to assist you. Thank you for using TechWelkin! Your articles regarding trust and NGOs are enlightening . These definitely give a direction to start any sort of institute regarding social causes. I myself want to start a NGO for creating mental health awareness amongst the Indian Mass which would mostly involve lectures at professional institutes. Can you please suggest me what would be a better option for such a cause… Trust or Society? In Some places god and goddess statues are in very bad situation/place. Now we are small group and want form a organization and do the cultural and religious work. We need total information right from starting and govt agency/dept involvements. Can we form trust or society or foundation and formalities in Bangalore . In this we are approaching archaeological department for help and donations from individuals, corporate. Lalit Kumar ji, thank you very much for doing this Nobel deed of helping people who care about running an NGO. Sir, I have three question to ask: can a registered trust for the objectives mentioned in deed of trust conduct public survey? Should we take any permission from district authority? Can we receive any fee for training / seminar or should we collect only donations and run the services all free of cost? Yes, you can conduct surveys, however, I am not sure if you need to inform the district administration. You can simply go to the DM office and ask for it. You can also collect fee from training and seminars but all this money should directly go into trust’s bank account. I wish to start a multi objective NGO, the objectives being Traffic discipline awareness, clean city campaign, making citizens more disciplined by organizing seminars, sticking bills, conducting educational lectures in colleges,schools etc. , helping retired military personnel by forming a team of dedicated disciplined NGO members. Please guide for this purpose should I go for a trust registration or a Society registration? I live at Nagpur(Maharashtra) and wish to work all over my state for now. In future I wish to take donations from Foreign companies who donate generously for such society improvement program. Would it be possible to take such donations? Thank you so much Lalit ji, your articles are very helpful. Firstly very thankful for the valuable information about society registration. I have few additional questions. Please help me out. 1. I along with my friends are planning to start a NGO society. The governing body members are residing in multiple locations outside India however we all belong to same hometown. So how do we go for the registration process where all of us cannot physically travel to our hometown now.can one person represent physically along with the id proof of others and get the registration done. 2. We are also looking for a website for these NGO.please let us know how to contact you for this. Satya, a friend of mine recently registered a society in Delhi and none of the governing body member was required to be personally present before the Registrar. Another person collected all the papers, PAN card copies and residential proof copies of all the governing body members and submitted to the Registrar. However, I will not take it as a rule. It depends on who the Registrar is. But even if he demands someone to be present, just one of the governing body members can do the job. As for the website, you can contact me after getting your NGO registered. Then I will look at my schedule and let you know. Dear Satya, I’m running a society for the past 7 years. For soceity registration; the President or Secretary (Who is mentioned as the executive officer in your bylaws ) is enough for personally present before the Registrar. But how can you perform EC meetings and AGB meetings with out E.C members in present?. You can plan and should mention it in the bylaws. For your purpose according to my view, Trust is the better one. Well explained, but I am confused about whether the foundation is a society or a trust? Foundation is just a word. How many members are required for a trust? managing trustee will be one or can be possible with two name. Is it possible to change members or managing trustee later on. is it possible if some member want to exit in between. What is the procedure to get 80G? I have written several articles that will answer your questions. Please go through them. Links are given in the article above. We five friends are starting a trust to spread blessings of meditation in society. We all are giving contributions to purchase land for trust. In later stage if one of friends wants to go out of trust, can trust return his contributions. If you give funds to trust as loan and later if trust has enough funds of its own, you can claim your loan back. Hi Lalit, you briefly mentioned here that a section 25 company can also be an NGO. Do you know the differences between a section 25 company and the other types of NGO (that you spoke of in this article)? Hi Abhiram, Section 25 company is also a way to constitute a social work organization. Although, I have never explored this option in details, but Section 25 company works in a fashion more like a regular company -except that it uses all the profit for the social cause that it is pursuing. I am sorry Kaushal, I can not give a qualified reply on this. However, as far as I can see, I don’t think there is any problem in your using the word Foundation in your organization’s name. HI. I want to know, is there any blogger who also runs the NGO? I don’t know about others, but I am a professional blogger and I do run an NGO. Thank you for this wonderful dissemination of knowledge which is highly useful to those who are looking for such valuable information. I along with some of my friends am looking forward to have an entity in the form of a trust or society. Towards this your feedback is highly useful. Sir, may I know some authentic references that you might have depended on as a part of your research in this area? Certainly it does not mean that whatever you have posted here are not authentic. All I have written here is based on personal experience. 1. I belong to Bihar and have permanent address/property there. At present I am staying in Noida on rent and having transferable job. I want to keep registered address of the trust in Bihar. Can I get trust registered in Noida notary office or will I have to go to Bihar and get it registered in the district notary office. 2. After my death I want all my assets to be given to the trust. For this I need to add supplementary deed in the trust deed and also make the same declaration in my WILL. The supplementary deed is to be drafted at the time of registering the trust or it can be done later on. 3. I do not know any lawyer here in Noida. Can any lawyer do trust work or there are some who specifically do trust work. 4. I also need to create website of my foundation/trust. Can you suggest some reliable website builder. 1. You will have to go to Bihar and visit the notary office who has the jurisdiction on the address where you want to register your trust. 2. I don’t think you need to make any supplementary deed. In your will, you can just mention your intention of donating all your assets to the trust. 3. Any lawyer should be able to help you. But it is better to find someone with experience in NGO related stuff. Also, you should look for a good CA because you will need one! 4. I myself develop websites. You can contact me when your trust is registered and settled properly. Hi, I have read at some places that for opening a trust, some kind of property is involved. What exactly does that mean? You need to have a property where your trust’s registered office will be located. This property can be yours or it could be rented. In case of rental property, you would need to take a No Objection Certificate (NOC) from the owner of that property. Is there any difference in between trust and charitable trust registration or it’s just a word like foundation is just a word. Hello Waseem, a trust can be a private trust or a public charitable trust. Commonly, when we say “trust” it simply means the public charitable trust. I am working in PSU. I want to start a school through trust. Can u tell me the which will be better to run a school either private trust or public trust or NGO? Working in PSU , is it possible to become a settlor for trust? Please advice me. You can run a school through both a private and a public trust. If your trust’s activities are not conflicting with your job, your job profile, your employer, their policies, their philosophy etc. then there is no problem, you can start a trust. I want to do work in education sector and my dream is to start a school. Need to understand whether should I register a trust or a society, which will be more useful in long term vision. Also wish to speak to u if possible, please share your contact nos. Amit, I have explained the pros and cons of both society and a trust in the article. Please read the linked articles also. You will get answer to your questions. “Society or Trust” is a question whose answer depends entirely on specific circumstances. Read the articles and then consult a lawyer to make up your mind.